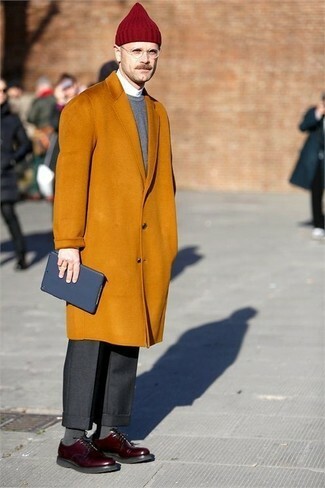 Pairing a mustard overcoat and black dress pants will create a powerful and confident silhouette. 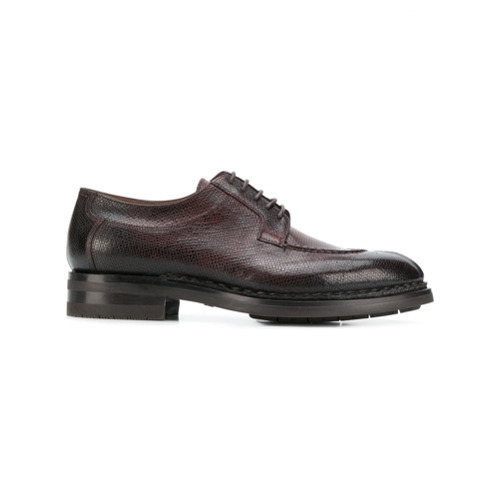 Throw in a pair of Santoni burgundy leather derby shoes to loosen things up. 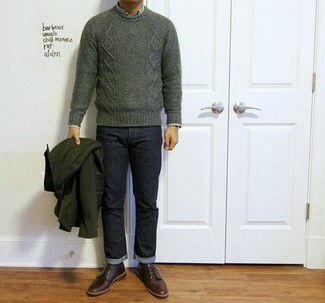 If you're scouting for a casual yet on-trend getup, consider wearing a dark green cable sweater and navy jeans. These two pieces are very comfy and they will also look incredible paired together. Wearing a pair of burgundy leather derby shoes is an easy way to add some flair to your ensemble. 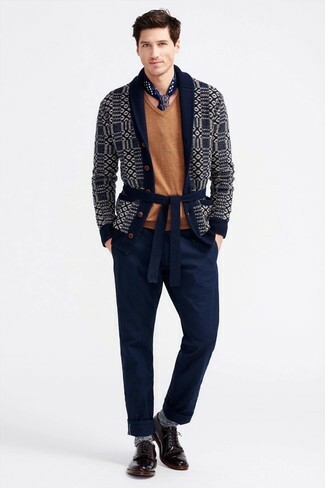 If you're hunting for a casual yet seriously stylish ensemble, team a navy print shawl cardigan with navy chinos. Both of these pieces are super comfortable and look great when worn together. A cool pair of Santoni Textured Gradient Derby Shoes is an easy way to upgrade your getup. 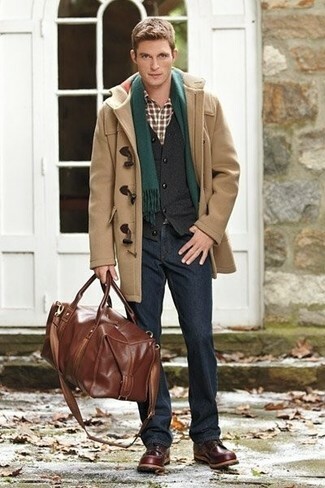 For a casually elegant ensemble, pair a camel duffle coat with navy jeans — these pieces play really well together. A pair of Santoni Textured Gradient Derby Shoes will add some real flair to this getup. 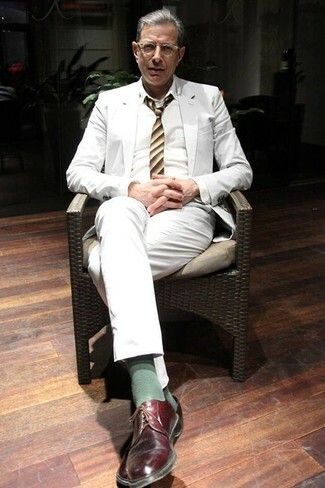 For a nothing less than incredibly stylish outfit, go for a white suit and a white dress shirt. 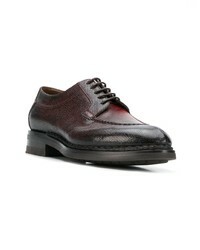 For something more on the daring side to complement this ensemble, go for a pair of burgundy leather derby shoes. For a smart casual getup, go for a navy double breasted blazer and tobacco chinos — these pieces work perfectly well together. When it comes to shoes, this look pairs wonderfully with Santoni Textured Gradient Derby Shoes. 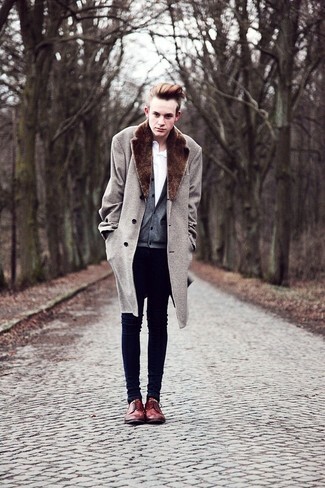 If you're searching for a casual yet stylish look, make a beige fur collar coat and navy skinny jeans your outfit choice. Both garments are super comfortable and they also look fabulous paired together. Bump up the cool of your outfit by wearing Santoni Textured Gradient Derby Shoes. 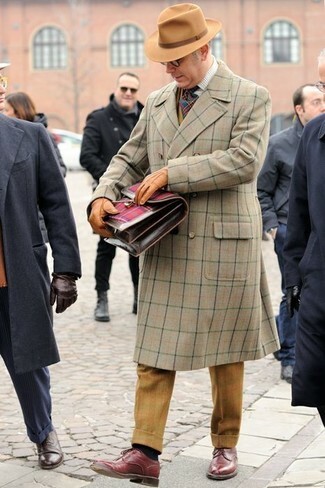 This combination of a grey plaid overcoat and tobacco chinos is very easy to put together in no time flat, helping you look amazing and ready for anything without spending a ton of time going through your collection. 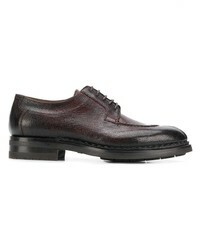 To add more class to your ensemble, round off with Santoni burgundy leather derby shoes. 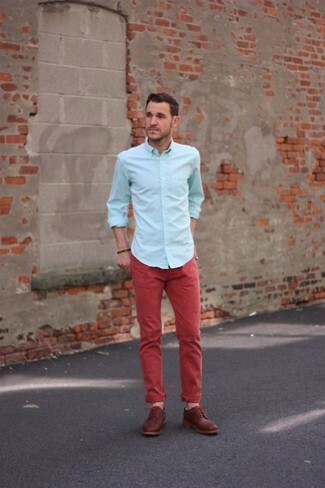 This combination of a light blue dress shirt and red chinos is very easy to pull together without a second thought, helping you look seriously stylish and ready for anything without spending a ton of time going through your arsenal. Channel your inner Ryan Gosling and opt for a pair of Santoni Textured Gradient Derby Shoes to class up your outfit.